Do you want to learn how to build a voltmeter in Python? This hackster.io tutorial will teach you how to do that, and show you how to incorporate your phone into the project. Thanks to the Zerynth App you’ll be able to read the results straight from your phone. Reading the output volt over the console. 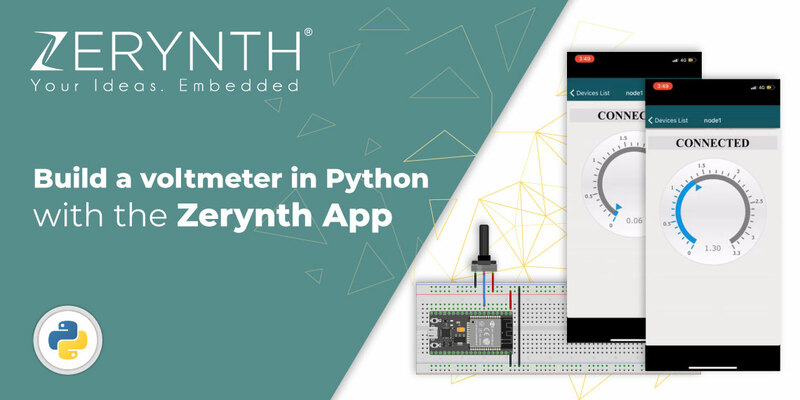 Transform the project to a higher level by reading the result wirelessly using Zerynth App. Advance the data reading using a graphical interface from “jqxKnob” element of the JQWidgets. Once you’re done with the first part, you’re ready to bring your project to a higher level. Read the results wirelessly over the Zerynth App. So, enable WiFi on the ESP32, connect it to the Zerynth App (which you can download here), and follow the rest of the instructions in the tutorial. If you think that this tutorial was fun, check out what else hackster.io has to offer with Zerynth tools. For example, this tutorial on how to build a temperature controlled desk fan in Python. The tutorial uses XinaBox xChips and Zerynth Studio. XinaBox CW02 xChip, that’s used in the tutorial, already has a Zerynth license onboard. Convenient, isn’t it? You can learn more about it here. And if you want to keep using the Zerynth App, take a look at this tutorial called IoT Ambient Light. You’ll learn how to control NeoPixel LEDs over the Zerynth App. Also, there are 50 projects you can learn from on the Zerynth hackster.io page. So, turn to it whenever you need inspiration. Now it’s your turn. Download Zerynth Studio and start a project. If you get stuck, there are a ton of tutorials both on hackster.io and on the Zerynth Academy that can help you along the way.